Dr. Louise Banks: If you immerse yourself into a foreign language, then you can actually rewire your brain. Dr. Louise Banks: Yeah, it affects how you see everything. Arrival, 2017, Directed by Denis Villeneuve, written by Eric Heisserer (screenplay), and Ted Chiang (short-story). Sapir–Whorf hypothesis: the structure of a language affects its speakers' world view or cognition. The language we speak is inimitably tied to the reality we experience. “Linguistic Relativity," Wikipedia, accessed 2017-04-12. Lately, I have been thinking about how I think. The Sapir-Whorf hypothesis suggests that the structure of a language affects the world view of those who speak it. How much does my language affect the way in which I think? How much does my personality affect the structure of my mind? What about my culture and my language? What about my micro-cultural experiences and my language? What about my family experiences and ways of thinking? These are questions we do not normally ask about ourselves. The answers are hard to get at. How do I know that my concept of time and your concept of time are the same? When I say “blue” do you and I see the same thing in mind’s eye? What comes to mind when I say “father”; for you; for me? The Sapir-Whorf hypothesis suggests that the structure of a language affects the world-view of those who speak that language. Some linguists believe that there might be a strong version of this hypothesis that says that once one learns a language, their brain is wired for certain conceptualizations which are intrinsic to that language. Others would only subscribe to a weak version of the hypothesis and suggest that a language can have some influence upon our world-view but that the concepts are malleable. I am not a linguist and not qualified to explain the concepts any more than this; but a recent experience with my daughter has helped me understand some of the differences in the ways in which we think. I was at my daughter’s home in Langley when the spring weather changed and went from sunshine with a few clouds, to a cloudburst that included heavy rain and frozen water. It will be clear in a moment why I called this “frozen water.” My daughter looked out the window and said, “It is hailing!” With some shock, I rose and looked out the window to see small pellets of ice falling from the sky. Now, technically these tiny pellets would qualify as hail, but my first reaction was to call them sleet, or ice pellets. Why the difference? Although she is my daughter, we each grew up in different micro-cultures. I grew up on a farm where the word “hail” struck fear in the hearts of men, women, and children. Hail, perhaps only second to tornadoes (which occur very infrequently where I grew up), is one of the most feared weather phenomena. Hail, destroys crops and takes away the livelihood of farmers. It is the difference between a year of bins full of grain, bank accounts capable of making loan payments and buying extra Christmas gifts; and taking the small sum of money from crop insurance so that there is hope of buying seed for next year. Our daughter, grew up in the city where hail might damage the garden or the shingles but did little more. “Hail” is not a fearful word for her. When my daughter uses the word hail we each have different reactions. “Hail” affects how each of us think and the effects are quite different. The movie Arrival made much of the strong version of the Sapir-Whorf hypothesis and used it as a major feature of the plot. In this movie, based upon a short-story, linguists learned the language of an advanced alien race and, in so doing, developed the ability to see the universe in the way in which the aliens saw the universe. The Heptapods, as the aliens were known because of their seven-limbed morphology, had the ability to see their lives in a continuous circle from beginning to end. The linguist Louise, learns the language to such a degree that she can see the beginning and end of the life of Hannah, her daughter, all at once, even before Hannah’s life begins. Working linguists can enjoy the fact that the movie delves into contemporary issues of scientific linguistics, but would be quick to say that the movie took even the strongest version of the Sapir-Whorf hypothesis to an extreme. If we understand our smart-phones as a form of computer-mediated language, there is one way in which a weaker version of the Sapir-Whorf hypothesis may come into play. An article in the journal, Science News, entitled “Smartphones may be changing the way we think,” says that there are initial indications that our electronic devices may be rewiring our brains. Although the study is preliminary, researchers suggest that smart phones are changing our brains; we just don’t know the details of those changes. 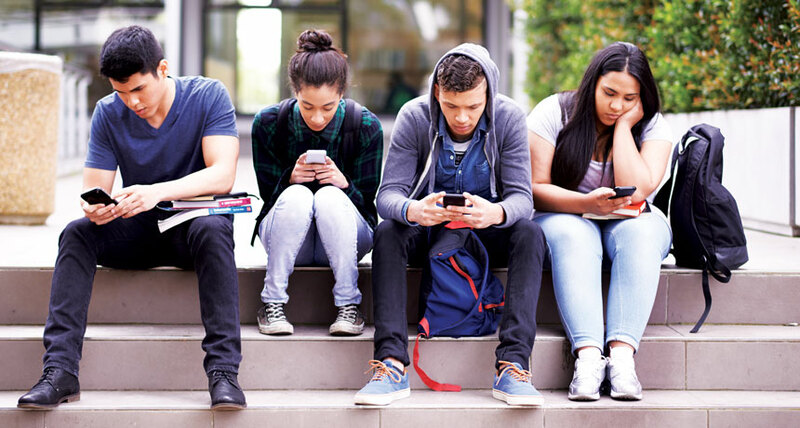 Thus, those who grow up with the constant presence of this fifth appendage may use different thought processes than those who adapted to the device later in life; but all are affected by using smart phones. Think about how we navigate in the world. Until a few years ago, if you wanted to go to a place across town or across the country, you pulled out a map and planned your route. As you drove, you either had to stop and refer to the map from time to time or have a trusted friend as your co-navigator. Remember the major arguments that developed between friends or husbands and wives when the navigating did not go well? Now, in the GPS era, we put the destination into our smart phone and listen to the pleasant tones of the smart phone voice as it guides us to our destination. We don’t even need to know where we are in the world, our device already knows that. Just be careful when navigating to Springfield, USA – choose the correct one or you might end up in a totally different corner of America than you planned. Language and thought processes are clearly, tightly linked. The degree to which our language imposes restrictions on our thinking is not clear. Much more research needs to be done in this area. Perhaps someone reading this blog will recognize the need for linguistic studies and decide to choose it as a career path; or perhaps, I have not clearly specified the terms and concepts and readers will leave more confused. How will my thought processes affect those of others?